The Junction Creek camp, also known as A Voice for the Voiceless Camp, is a Two-Spirit led Indigenous reoccupation of unceded St’at’imc land in the Yalakom Valley to prevent logging. It has been set up since March 16th, 2015 and welcomes supporters to join them. I’m the spiritual leader in Xwisten, St'at'imc territory, a place called Junction Creek. Some of the elders sent me here to protect Mother Earth from bad logging practices that have been going on in our territory, as well as to protect our old village where three nations, Secwepemc, Tsilhqot’in and St’at’imc, used to come together and meet. I’ve returned to the land and continue to practice the hereditary way of life which is in opposition to the elected chief system. The elected chief system gave rights to these logging companies to come in. As a spiritual woman, it’s my responsibility to hear and stand for the people. The industry itself has acknowledged my presence on the land, but they feel that the only way they can function is through the elected chief system and the laws under the Supreme Court of Canada. We need help rebuilding our village so we’ve been asking people to support us. We ask visitors to apply their skills and to show the world that they are good people. We need supportive ways to heal with people as well as heal the land, and clean the land. As a spiritual stand we have sweat lodges there, we have pipe ceremonies, we have healing sessions because it’s important that people that walk upon Mother Earth carry themselves in a much more respectful manner. My goal is to see our people reutilize our lands the way our people did only a couple hundred years ago, to let go of convenience, and to honor animal life. I would like to see us take our rightful place in nature, but in a respectful manner. 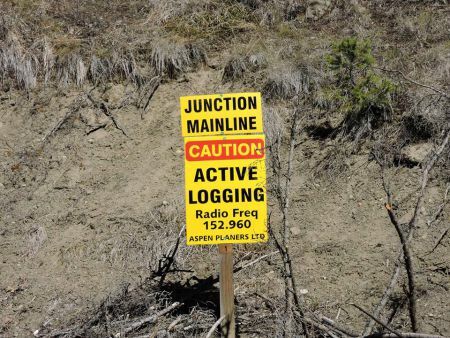 Last summer you took footage of pit houses the logging company, Aspen Planers, had built over with logging roads. What other plans does Aspen Planers have for this area? The road that they built runs over some holes, which they covered with fine gravel and matting. The Tribal Council thought this was efficient. To the elders and to the spiritual people… they were saying it’s not, that’s not acceptable. So Aspen Planers backed out. They’re allowing the Xwisten Chief and Council to deal with us on the mountain. While they backed out of Junction Creek, they’re continuing to log in other areas of our territory. So I do see some positive change in how they’re behaving, but they’re still there. I think the bigger issue now is that there is an encroachment upon our territory by another Nation. We share some lands that are overlapping, and they’ve clearly stated their intention to clear-cut where we’re living. We don’t know how to approach it because this is a Nation to Nation issue and we’re hoping the Nations will sit down and have these important conversations without allowing the Supreme Court of Canada, or any other outside entity, to dictate or structure how we’re going to deal with ourselves as Xwisten people. Do you mind answering which Nation it is? They’re under the Northern St'at'imc Treaty. Not everyone in that Nation supports it. The treaty process that was presented to the northern part of the St'at'imc Nation had a landslide vote in favor of it; however, the vote was stopped by warrior women. I hold my hands up to those women that are out there doing the hard work of interfering and giving the people time to know what's going on before it’s chosen for them. These actions are necessary. We pray every day for all the front line people and all the front line stands. Like I say to people who come up to the mountain to be with me: be the best you can be. We need people to wake up to reality and stand strong.